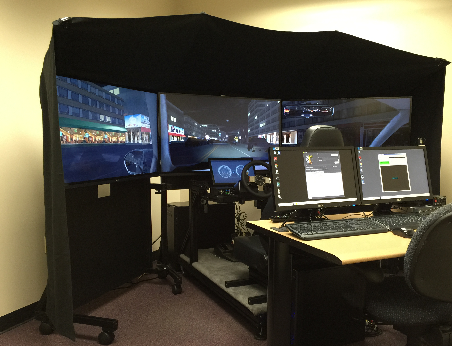 The MiniSim is a PC-based research driving simulator with powerful scenario editing and data acquisition capabilities that is based on over a decade of research and driving simulation experience at the University of Iowa’s National Advanced Driving Simulator (NADS). 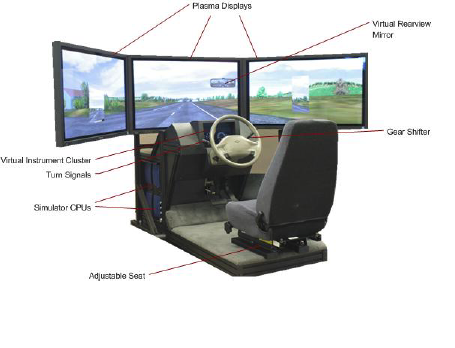 The NADS MiniSim™ driving simulator, is a highly flexible PC-based driving simulation system. It uses the same advanced technologies built into the more sophisticated large NADS simulators, at a fraction of the cost to build and operate, and is easy to customize for specific applications. The system has a very small footprint and is highly portable. The configuration data for the virtual environment are in the same format as those used by the large NADS simulators; therefore, studies designed for the MiniSim™ can be easily carried out on the latter when a simulation of higher fidelity is necessary.